The betel nut or Chien Mahk as it is known in Thai has been used in Asia as a drug for probably the last 4,000 years, now the use of this stimulant is slowly dieing the death and it is only the occasional old Thai lady you see chewing on this, it doesn't seem that the next generations of Thais will take their place and follow this tradition. 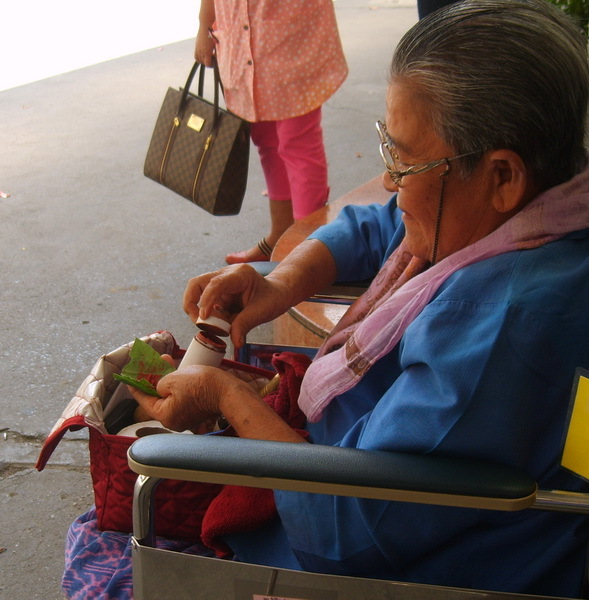 To spot a betel chewer look for a bucket/bowl or something similar with bright red saliva in and around it, as the old ladies chew on the concoction it produces copious amounts of red saliva which they have to spit out, yes, that could be your mother-inlaws. It was around 200 years ago when the Thai Government tried to modernise Thailand by stopping people from taking this drug, now the custom is slowly dieing out as the older generation departs from this earthly world. To create your betel nut chew you will need your paste, this is hard work crushing up the nuts etc, a small mortar and pestle type contraption, this old lady is using a brass set, the pestle is designed like a nail, but very thick, the mortar is a brass tube, the paste is spread onto the torn leaf using the pestle, tobacco can also be added, the leaf is then folded, this old lady then pushes this into her mortar and compresses it all with her pestle, place in mouth and enjoy remembering to have bucket or bowl for the red saliva to go into. With this Thai custom running for so long you can find some interesting old brass implements which were used in the old days for taking betel, many were handed down from grandmother to daughter so it can be quite interesting going through the old family heirlooms. 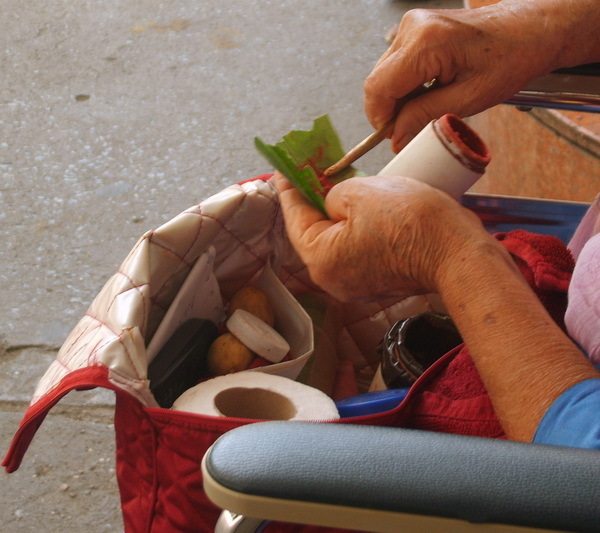 In this first photo she has in her hand a torn leaf, the container for her betel paste, and of course her brass pestle which she is using to spread the paste. All cooked up and ready to Rock 'n Roll.